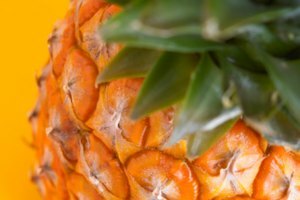 If you prefer to avoid eating rotten fruit, it's helpful to know how to tell if pineapple is bad. Fortunately, it's usually not too hard to figure out when pineapple is past its prime whether it's still whole or has been cut up. Knowing its shelf life, how to pick out a ripe pineapple and how to store it both uncut and cut is also useful. Mold is growing on its leaves or body; white spots on the leaves are usually fungus. It is soft and pliable to the touch or has soft spots. It smells vinegary, pungent, fermented or sour, especially near the bottom. Its bottom is soft, wet or has whitish secretions. Its rind is an orange, dark gold or brown color (it should be green or yellow). The leaves on its crown are browning (beyond the very tip), wilting or falling out. It generally looks dried out, withered, not fresh or otherwise unhealthy. Fresh or canned cut pineapple begins turning a paler yellow, eventually approaching a whitish color once it passes its peak. It also starts drying out, which is more noticeable if it's not stored in its juices. What About White Spots on Pineapple? White spots on the leaves or exterior of a pineapple are likely to be mold, and the pineapple should be discarded. 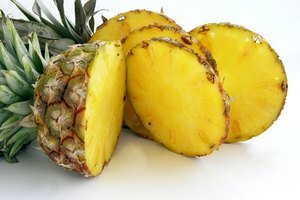 Fuzzy white spots on the outside of a pineapple or on pieces of cut pineapple are also probably mold, and you shouldn't eat it. However, sometimes you may notice things that resemble white polyps on pineapple flesh along indentations. 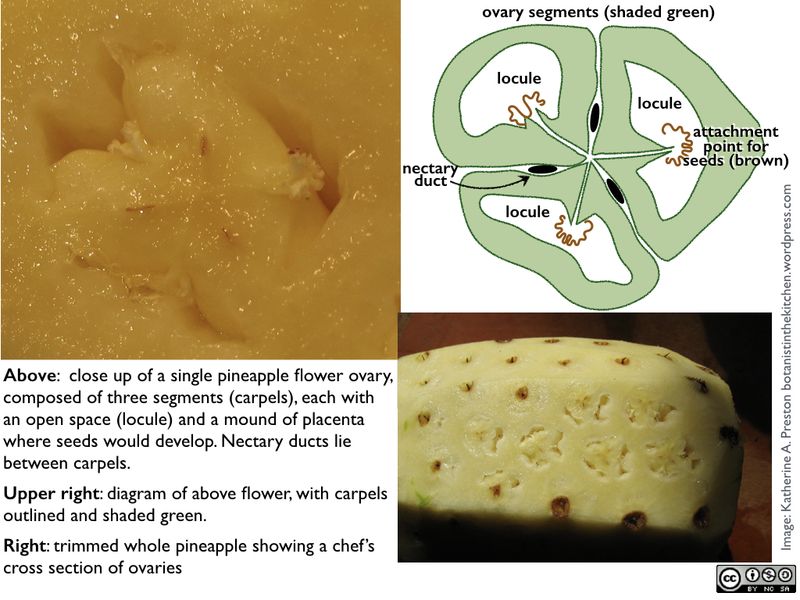 This is the part of its ovaries where seeds would develop. These white spots are not mold or a sign that the pineapple is bad, and they're safe to eat. 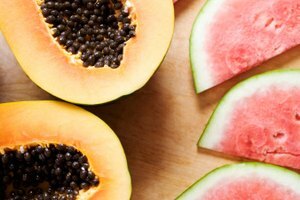 Avoiding bad pineapple is one side of the coin, and picking out ripe pineapple is the other. The good news is that if pineapple isn't rotting on the store shelf, it's probably ripe and ready to eat. Pineapple doesn't ripen any further once it's off the tree, so harvesters wait for it to be ripe. These days, they often test the sugar levels to be sure. Ripe pineapple smells fragrant and sweet on its underside. Its rind is green or yellow (there's a common misconception that green means it's unripe, but that's not the case), and its netting pattern is raised and tan. The pineapple should be firm all over, and its leaves should look green, vibrant and healthy, and the rest of it should look good and fresh too. Knowing how to store your pineapple and for how long helps you minimize waste and better determine when it's time to toss the fruit if you don't get through it quickly. Fresh, uncut pineapple can sit out at room temperature for two or three days, and although it doesn't ripen or get any sweeter, its fruit may get a little softer and juicier if its rind is still green. It lasts more like four to five days in the fridge, but this slows the softening. Once it's been cut or the can has been opened, pineapple should be refrigerated and eaten within three to five days. To best preserve its quality, keep it in an airtight container. Exposure to oxygen causes a gradual browning in cut pineapple pieces; this can be slowed by squirting some citrus juice over it. Pay attention to the expiration date on canned pineapple. Don't freeze a whole pineapple. If you can't eat it fast enough, or you want to stock up during an amazing pineapple sale, you can freeze cut pineapple. The best way to do this is to freeze the pieces before you package them for storage. Line a baking tray with wax paper and lay out the pineapple pieces in a single layer, freeze them and then vacuum seal them in a freezer bag (or press as much air out of the bag as you can if you don't have a vacuum sealer). For peak quality, use frozen pineapple within about six months. HGTV: Can You Freeze Fresh Pineapple? 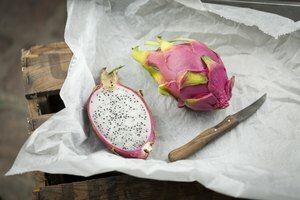 Eat By Date: How Long Do Pineapples Last?